Are you a closet hippie? Do you enjoy expressing yourself with bright, funky colors? Well, then slip into your bell bottoms, crank up the tunes and get ready for Tie Dye Doodle! Tie Dye Doodle lets you tie dye your way. 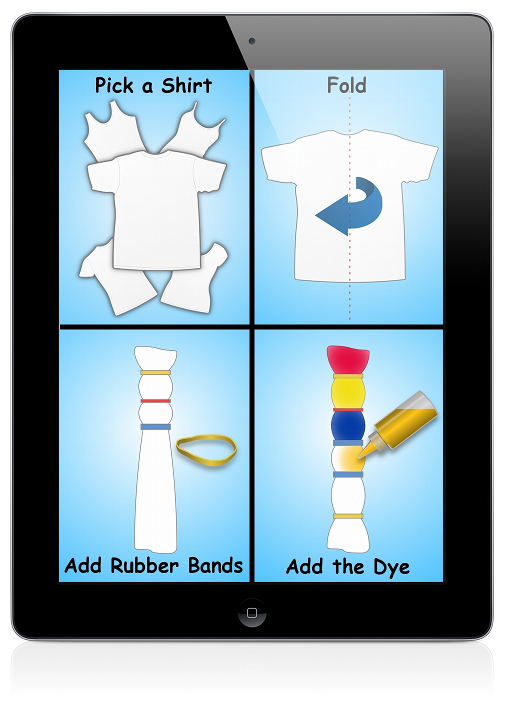 Choose your shirt, fold it, place the rubber bands, pick your colors and add the dye any where you want. There are infinite design possibilities because, like a snowflake, no two are ever the same. When your tie dye is done, you can decorate it even more with fabric and glitter paints, rhinestones and appliqués. Try it on a model, save it to your photo album and e-mail it to a friend. Best of all, as with all of our Doodle apps, there's no mess to clean up!